Ignacio PecinoSpatial and Kinematic Models for Procedural Audio in 3D Virtual Environments - Procedural Audio Now! Ignacio Pecino gave a demo of some recent research in procedural audio, and talked specifically about his use of spatial data in simulated physical systems such as cellular automata (‘Life’) to drive sonification models in SuperCollider. In his Apollonian Gasket simulation, he takes data gathered from the motion of the component discs when they are made to spin like coins, and uses it to dynamically modify parameters in a SuperCollider synthDef. Using flocking behaviour alogorithms in another simulation, ‘Boids’, he generates complex, evolving soundscapes that have a highly satisfying correlation to the movement of a flock of birds in a 3D virtual environment. We look forward to more hearing sonifications on his next visit! 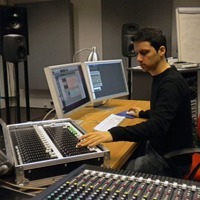 Ignacio Pecino is a PhD candidate in Electroacoustic Music Composition at NOVARS. The paper on which this presentation is based can be viewed here.